MITWITZ, Germany — A handful of crumbling Cold War-era watchtowers peek out of forests and meadows at what was once the border separating East and West Germany. For nearly 40 years, this 870-mile-long and up to 650-foot-wide strip of land was closely guarded by Communist soldiers with barbed-wire fences,mines and antivehicle ditches to prevent would-be defectors from crossing the Iron Curtain. But in the nearly three decades since German reunification, the area has remained relatively undisturbed and become an ecological treasure trove of biodiversity. The uninhabited land has been transformed from "a death zone into a lifeline," according to the nature conservationist Kai Frobel. Only a few stark reminders of the past, including overgrown concrete patrol tracks, can be spotted today in what Frobel coined the Grünes Band, or Green Belt. "Nature essentially had been given a 40-year holiday," said Frobel, who is considered the father of the Green Belt. The former restricted military area was once part of a border that divided German families. As a teenager in the 1970s, Frobel often bird-watched along the highly fortified border with East Germany. "When we grew up in this area, we all thought that this monster of a border line had been built for eternity," Frobel, 58, said. "No one, really no one, believed in German reunification at the time." 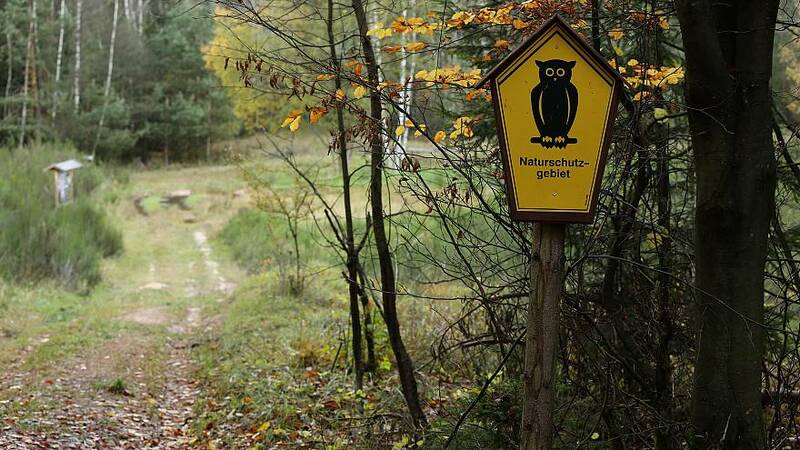 When East Germany's communist regime collapsed in 1989, Frobel and a small group of fellow nature enthusiasts set out to preserve the land as it was. They feared the land could become a "brown belt" if it became used for agriculture or painted gray with roads built on it. As Germany was quick to dismantle nearly all border installations, they lobbied for the area to be protected and recognized as an official natural monument. The Green Belt is now home to more than 1,200 highly endangered species. Eighty-seven percent of the Green Belt remains in a near-natural state, serving as a unique refuge for animals and plants, including rare orchids, like the lady's slipper, and birds such as the black stork and red-backed shrike. "You will find no other place in Germany with the richness of habitats and species that the Green Belt provides," Frobel said. Passing by a small creek, he held up a thick-shelled river mussel. "This is an endangered mussel that I found right here, in an area that was once known as the 'death strip,'" Frobel added. Frobel's German project is considered the model for the European Green Belt — a massive conservation corridor that runs along the line of the entire former Iron Curtain that divided the European continent into East and West. The European Green Belt today runs more 7,500 miles — from the Barents Sea at the Russian-Norwegian border all the way through central Europe to Bulgaria and the Black Sea. It connects a total of 24 countries and 40 national parks. In October, Frobel and two other activists were awarded a prestigious prize from the German Federal Environmental Foundation, which cited them for having "called into life a European vision for the Green Belt and a symbol for overcoming the Cold War." Frobel and his team have also been in contact with South Korean authorities about future plans to turn the Demilitarized Zone between the country and North Korea into a similar wildlife refuge. "If and when the inner-Korean border line collapses, officials are now very well prepared for a Green Belt Korea," Frobel said. He hopes that the Green Belt will serve as a living memorial to a difficult period in German life. "I think there is no better way for future generations to remember this part of history," Frobel said.